Poor performing EU member states are failing to meet waste diversion targets, a new EU Report explains. Cyprus, Croatia, Greece, Malta and Turkey are still sending more than three quarters of their municipal waste to landfill. The EU will also, soon take Slovakia to court for violating landfill rules, and failing to achieve sufficient waste diversion away from them. If the ambitious landfill waste diversion targets (waste diversion and recycling targets), which are essential to meet climate change reduction targets, are to be met, much more needs to be done. It will be vital that all EU member states work together to raise the public perception of the concept of the circular economy. The number of people that have truly thought through the meaning of the circular economy are still too few and far between. In fact it would appear that very few people outside the waste management industry know what it means. 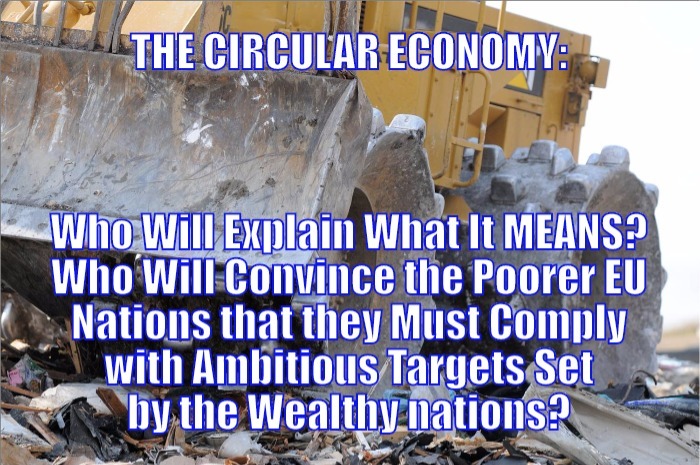 The lack of understanding even among journalists, is evident from the way that the popular press seldom go beyond using the term “recycling”, when they should be referring to, and explaining, the “circular economy” to the public. Big business is ahead of the public in their willingness to embrace the ideas of the circular economy. In the opinion of the author, the majority of the largest globalised companies now see the circular economy as an essential benefit to businesses. It is seen as providing both sustainable material flows, and more stable raw materials prices And, on top of that, shareholders so much want to invest in green organisations that they seem to be quite capable of forcing company directors to sit-up and take notice, or else see share values fall. Unfortunately, the author’s opinion is that in many EU member states the public have no idea about this sea-change at board level which has happened within many companies. The public have not been informed that recycling, although a valuable concept, is due to be replaced by their governments by the “circular economy model” which will, from now on drive policy decisions, and is far more all-encompassing than recycling alone. Unless in the minds of the public, the concept of the circular economy is understood and supported, the ever increasing levels of recycling may just seem like a burden. A never-ending burden on their rates, and a cost too far. Overall the EU recycling/ waste diversion picture represents good progress, as outlined in the figures given below. But, can even the necessary landfill reduction the targets, really be met? Less of Europe’s household rubbish is being sent to landfill and more is being recycled than 10 years ago. A new report from the European Environment Agency (EEA) compiled municipal waste management statistics from 2004 to 2014 in all 28 EU states plus Iceland, Norway, Switzerland and Turkey. The report shows 27 of the 32 countries reduced their use of landfills, with the overall rate falling from 49% in 2004 to 34% in 2014. 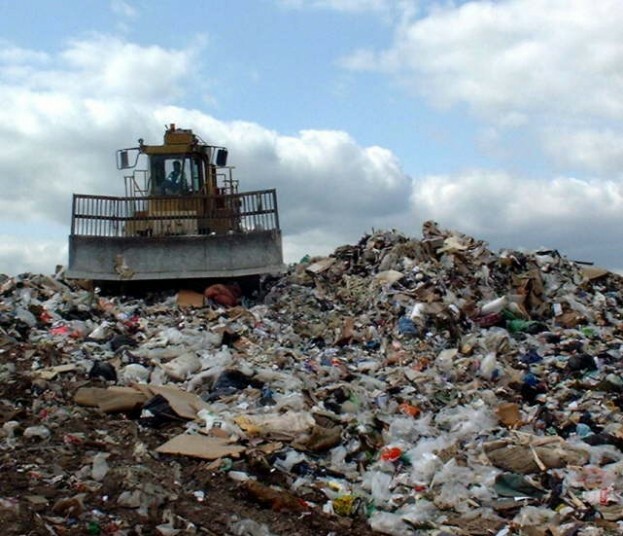 In eight countries, including Sweden, Norway and Switzerland, almost nothing went to landfill. Overall recycling rates also saw an improvement, rising from 23% to 33%. The UK saw a massive increase from 23% to 44% during the period. However, the results were not entirely consistent across the board – in seven countries, the proportion of recycled municipal waste barely changed and in two, it decreased slightly. Cyprus, Croatia, Greece, Malta and Turkey are still sending more than three quarters of their municipal waste to landfill. These figures will need to improve rapidly if the EU’s 2020 target of recycling half of all household waste is to be achieved, the EEA states. Despite progress in living up to European legislation on waste management, the outlook for reaching the EU’s 50% recycling target for municipal waste by 2020 is mixed and many countries will have to step up their efforts, according to the EEA. It says that it is important to note, however, that the data used in this assessment do not necessarily show progress against the target for all countries. Member states can choose between four different methods to monitor their progress, and the data uses the same method for all countries. In addition, data on waste and indicators is limited in some cases. Countries have different definitions of what constitutes municipal waste or the make-up of recycled material. For example, some countries include only waste from households, while others include similar wastes from commercial activities and offices. Improvements in waste data and further harmonisation of national reporting methods would help the effectiveness of policy measures. The EEA says municipal waste only accounts for around 10% of total waste generated in the EU, but it remains a visible problem. 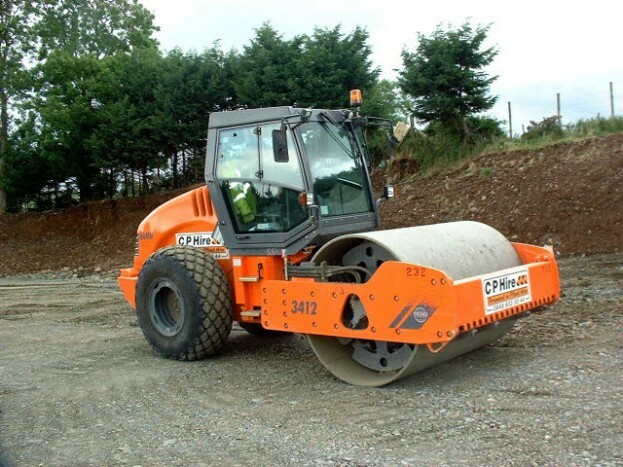 Preventing it reduces the associated environmental pressures and recycling would help turn waste turns it into a valuable source of material for the economy. Many of the barriers identified in the cases are already being focused on and are being addressed through the circular economy action plan, according to the Commission. In this instance, the analysis of the interface between waste and chemicals legislation or the development of plastics strategy. In addition, ongoing and scheduled REFIT exercises will also be informed about the results of the study. This does not mean that all barriers can be removed and certainly not easily: barriers stem from different, possibly conflicting regulatory objectives (e.g. public or animal health, environmental protection). Any of these may be considered as more important than the circular economy. Moreover, the regulatory arrangements can be part of a very complex system that may be difficult or expensive to change. It is an uncertain picture, and once the exit of the UK gets underway, the removal of UK funding to the EU in general must surely be looming problem for the whole of the EU. The indication must be that the remaining wealthy nations will have to dig deeper into their pockets to fund the many waste reduction schemes to which the EU is now committed. I am ѕսre some sort of regulator is needed to check up on EU countries to make sure that they are complying with the laws which you can find all all the many Directives. They are too many to count I know, but unfortunately I do feel that countries must step up to the mark on this and do the right thing and stop putting so much waste into landfills. I do agree that they should, meet their commitments too. It is important to make sure their goods are sustainable and can be reused.﻿ Who will own the materials in circulation rather than keep mining and exhausting finite resources? If our house waste will become worth a lot of money soon, why do we not keep all our metal cans and after washing put in the loft. If you say circular economy comes one day these will be worth a lot of money to sell for the recycling. Yes? Why not? Why is Croatia silent on new European waste management guidelines? The European Union wants its members to recycle much more waste than they currently do. Although Zagreb is known as “the capital of garbage”, the Croatian government is silent about issues it wants to negotiate. In March, the European Parliament voted in favour of an ambitious new policy for the sorting and recycling of waste. However, the further process of political negotiations between EU member states is not proceeding smoothly. Only ten countries have explicitly supported the stated goals. So, what does Croatia want to do with its waste? Green Action, the most prominent Croatian non-governmental organisation for environmental civil activism, believes that such behaviour of executive power is unacceptable. I am extremely happy when reading along with your travail. Very good intellect, and also with the format in your blog, provides the good translation often times. The UK should not do the Brexit. The UK should stay. Stay to chase the other countries which sign for the goal of No Waste to succeed. This is important to all EU. Everyone can easily cut down their own waste (reusing paper towel – this is easy dry your hands out the towel to one side. Reuse it to clean the next spill you make, or use as a grease rag while working on your car). His is more – Recycle your metals and glass. Make use of paper wrappers on what you buy. Use them as cleaning cloths/rags (I mean they are ideal as first wipe over of really dirty things.). I could go on. Rinse and reuse as plastic cups all your yogurt pots, make and use canvas carry bags each time for the groceries. Compost all your food scraps, or feed them to your animals. Tis is how it is done.